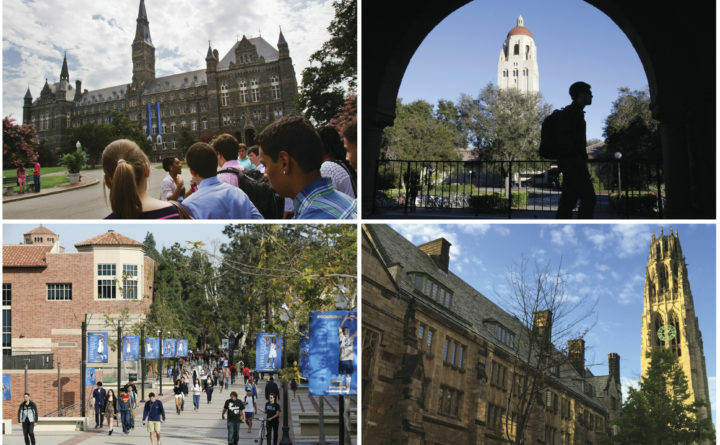 This combination of images shows college campuses, clockwise from top left, Georgetown University, Stanford University, Yale University, and University of California, Los Angeles. Prosecutors said dozens of parents paid bribes to alter their children’s test scores or get them into these and other colleges. The scandal underscored deep divisions on issues of class, privilege and race that are dominant themes in the political debate and part of daily discussions by regular Americans. For years, I’ve listened as people complained about black college students benefiting from affirmative action, but until last week, I had never heard of any major pushback about people using wealth and influence to get white students into schools they otherwise couldn’t get into. If folks had any reaction to this troubling practice, it was mostly a shoulder shrug, if that. And until last Tuesday, when federal authorities announced that 50 people had been charged in a scheme to bribe college coaches and others so their kids could get into the nation’s most elite colleges, it had never been challenged in a big way. America may have been largely quiet on this kind of thing but never so on the topic of affirmative action, which critics have long contended gives an unfair advantage to African-American students. I’ve been reflecting on this as I’ve watched this admissions cheating scandal unfold. Many of the loudest critics of affirmative action ignore the historical and systematic disadvantages that black people have contended with for centuries and demand a color-blind but also level playing field. But when it comes to the issue of entitlement of the rich, there has been virtual silence, aside from occasional questions about how certain members of the Trump administration, including Jared Kushner, may have ended up at elite educational institutions. I’m glad that this long-accepted but nefarious practice of allowing the wealthy to buy their way into certain high-status schools has been exposed for the illicit practice it is. As a nation, we should be in an uproar. We’ve been hearing about this kind of shadiness on university campuses for years. As the saying goes, the rich get richer, and this is one way that wealth gets leveraged before young adults even make it to the workforce. Lori Loughlin, whose credits include the TV show “Full House,” is among the notables caught up in the scandal. The actress, who is accused of paying a $500,000 bribe to have her two daughters designated as crew team recruits at the University of Southern California, surrendered last Wednesday. Ironically, when black people enter traditionally white spaces on certain college campuses and in the workforce, they often are treated suspiciously even if they have not benefited from affirmative action. It will be interesting to see if this scandal, code-named Operation Varsity Blue, ignites the same passion. Maybe one day, some rich kid will be confronted by a classmate questioning how he landed a spot at XYZ University. Perhaps the wealthy will have to get used to being second-guessed the way so many black students have been for so many years. They will see how it feels when classmates demand to check their grades or SAT scores to see if they qualified for their spot at an elite university. It could happen, but I won’t be surprised if it doesn’t. This is still America, and the wealthy are entitled to many breaks that the rest of us are not, on taxes and otherwise. Jenice Armstrong is a metro columnist who writes about local and national news for the Philadelphia Inquirer, Philadelphia Daily News and Philly.com.